As an example, consider the six-layer striate cortex. [ref]Also known as V1, the primary visual cortex, in the occipital lobe. [/ref] First, radial glial cells extend processes toward the marginal zone; these will serve as “tracks” which migrating cells can follow. The young neurons, or neuroblasts, resemble ordinary cells, and do not yet possess neurites. About two thirds of them follow the radial glial cells upward towards the outer surface of the brain. The first to migrate form a subplate and begin to differentiate into neurons. The next neuroblasts pass through the subplate and arrive in the cortical plate where they start to differentiate in turn. In the case of the striate cortex, they will form layer VI[ref]That’s a Roman numeral “6”, not “Vee one”. [/ref], the innermost layer. 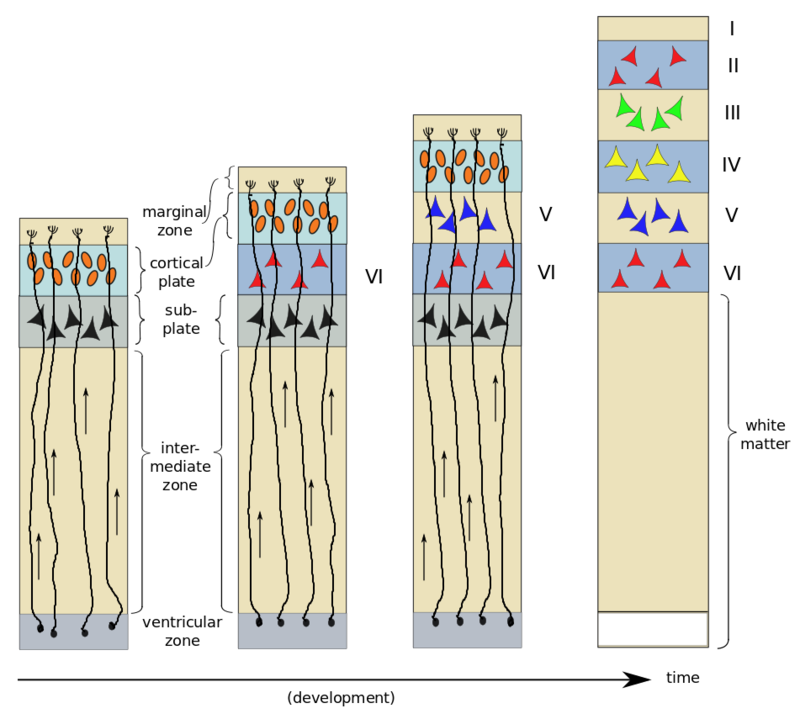 The next neuroblasts pass by the Layer VI and start to form Layer V. This continues, with one layer being formed after another until all six cortical layers have been formed – in reverse order, or “inside-out”. After all six layers are formed, the subplate disappears and the radial glial cells withdraw the radial processes. Growing neurites, which can be quite long and travel far in the body, advance as the growth cone at the tip of each one extends filopodia to drag it along an extracellular matrix of fibrous proteins. The axons tend to grow in groups of neurites stuck together[ref]“Axons which stick together grow together”? [/ref], each group dragged along step-by-step by one axon called the pioneer axon. The growth cone is attracted or repelled by various chemical substances already released during embyronic development. The concentration gradients of such chemicals guide the axons to their destinations. Further detail on connections is furnished by molecular surface markers on target cells; these markers are recognized by specific growing axons.